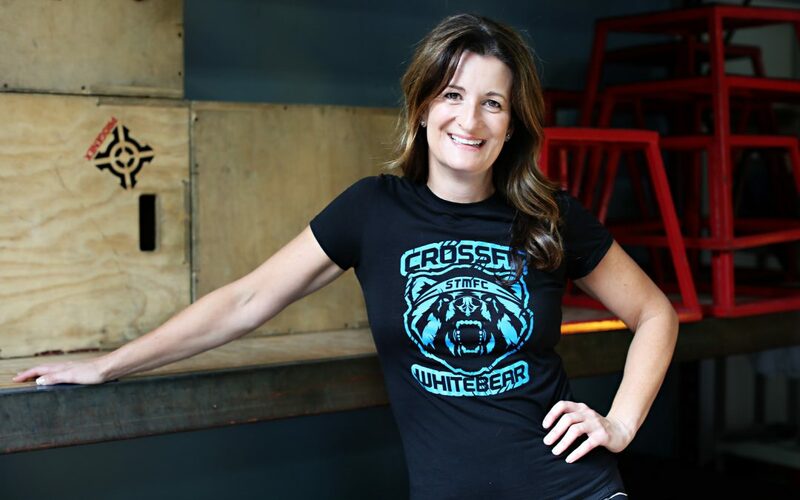 How did you hear about CrossFit White Bear and how long have you been a member? My first experience was an open house in May 2014. When I walked in, shoes were pilled up at the door, people were yelling and screaming as others were scaling walls & dropping weights. It was like a super hero training camp where everyone spoke a foreign language, WOD, OLY, AMRAP? I agreed to attend the open house with a friend, she was a no show. I wanted to leave in the worst way – it was the most insane place I had ever seen! After a short period of time (3 months) this all became normal and I learned the language, now I cannot imagine this not being part of my every day life. When you don’t want to workout, how do you motivate yourself to walk in the door? Not coming is not an option. The results and other members are so motivating, I never want to miss. I build a class at least 4-5 times per week into my schedule. I usually schedule my week on Sunday’s & reserve the classes I will attend for the week. CrossFit is for everyone, the scaling options are brilliant & they work! I had a shoulder injury when I first joined and struggled with so many movements. Today, it is a thrill to be able to get a kettlebell over my head. 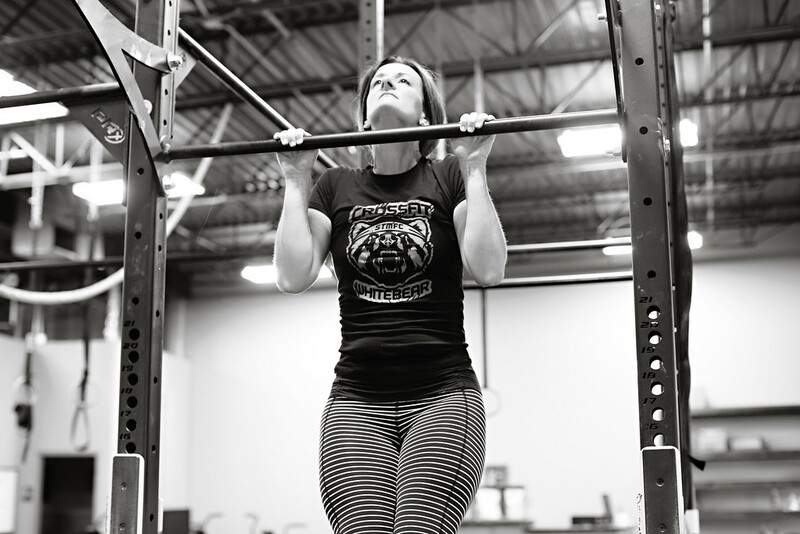 A strict pull-up year one was a big accomplishment for this suburban housewife and mother of 2 – thank you Thomas! You have tried other workout programs before CrossFit White Bear? How are we different? Yes, I have always belonged to a gym. CrossFit White Bear is different in so many ways! The biggest differences for me have been the supportive community, so many words of encouragement from coaches and other members as you fight for every last rep. As I looked around at the other members and coaches I knew they were doing something right, I had never seen so much lean muscle mass in one place before. It was very motivating & still is on a daily basis. Secondly the fitness program is so varied and I thrive on change. The workouts are never the same, each day you workout with a different group of people and the workout is different every time. Third, nutrition, during the first 6 months I asked the coaches & members what they were & were not eating, so I changed my diet to include more protein & veggies and reduce my carb intake. Like our last member spotlight Sam, you realized getting fit not only involves being active but making healthier decisions when it comes to your diet. Tell us about the changes you have seen since consistently showing up to the gym and working with Luke Popham at Bear Nutrition. In November of last year I decided to participate in a weight loss challenge Luke was hosting. I had lost 20 lbs to date and the holidays were upon us and I did not want to lose any momentum. The information I gained from Luke during the challenge was life changing! Luke helped me build a sustainable nutrition plan. And now my family is addicted to his protein shakes, we eat them every morning for breakfast. I now had someone to hold me accountable for my nutrition as I did for my fitness. It is an incredible combination CrossFit White Bear & Bear Nutrition with both organizations in my life I have lost over 30 lbs and had a blast doing it!